A pergola is one of the best additions you can make to your outdoor space. It adds shade, makes your backyard visually appealing, and makes a great centerpiece for a deck or patio. That said, there are a few things you’ll want to consider before you pick up the phone. 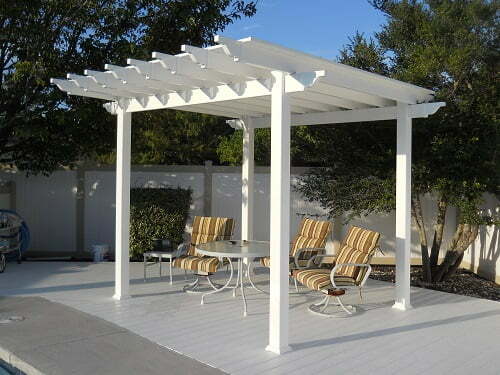 One of the biggest considerations is what material you want your pergola made from. Many pergolas these days are made of wood, but that doesn’t mean wood is the best choice. A wood pergola has all the same problems that a wood deck or fence has. Namely, wood pergolas need regular upkeep and maintenance, and they are vulnerable to moisture, insects, and time. A better option for most homeowners is a vinyl pergola. Unlike wood, vinyl pergolas don’t break down or change appearance over time. They are virtually maintenance-free and don’t require any special care or treatment. And they last far longer than wood, making them the only “lifetime” pergolas on the market. Another important consideration is the size of your pergola. Bigger pergolas provide more space and more shade. You’ll also want to consider the size and shape of other home or landscape elements, like your roofline or the shape of your patio. If you want a custom pergola that follows the shape of its surroundings, we can do that. You’ll also need to think about where your pergola will go on your property and how you will use it. For instance, if you want your pergola to be a garden centerpiece, you may want a different style and accessories. If you aren’t sure where a pergola would be best on your property (or you don’t know if it’s possible to install one where you want it), give us a call. We’ll schedule a free no-obligation consultation to answer your questions get you the info you need. Depending on how you want to use your pergola, you may want it to have a certain “look.” Some people want a pergola that is classic and understated to serve as a simple shade structure. Some want a modern pergola to use as a space for entertaining. Others want a rustic look to complement their garden. All of these looks are possible, but you’ll need to consider them before you buy. Take a look at pictures in our gallery, or check out your favorite home or garden magazine for inspiration and ideas. At Future Outdoors, we provide full installation services for our vinyl pergolas. This ensures you get a quality shade structure that is built to last. However, you’ll need to think about the installation process for your pergola. Remember that our installation crew will need access to the site to bring materials and equipment in, so don’t choose anywhere that is too hard to reach. Want to get the best deal on a quality vinyl pergola in the Dallas metro? Call Future Outdoors today. Our expert installers are ready to answer your questions and help you design the right pergola for your home. Call 972-576-1600 today or visit us on Facebook to see pictures, reviews, and testimonials from our satisfied customers.